This Monday (February 17th! 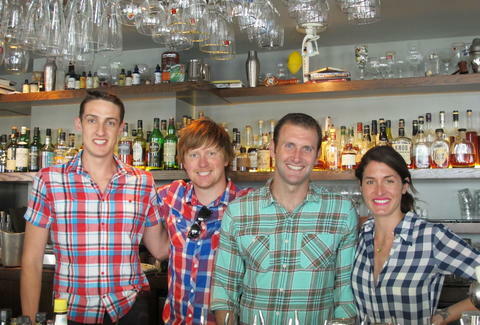 ), all three of the super-handsome sorta-handsome guys behind Thrillist SF (and the super-lovely lady from Daily Candy SF) will be slinging drinks at one of Thrillist's favorite bars (and places to get tots): Burritt Room + Tavern. We'll be mixing four different drinks -- the Snarky Buck, the Mezpal, the Sarsaparilla Sling, and a Beer & A Shot (of Four Roses Bourbon!) -- from 6-8pm, with a bunch of the monies going to charity. So come have a drink, and yell at them in person for not choosing your favorite pizza place. Joe Starkey is Thrillist's San Francisco Editor, and really doesn't like being yelled at. Follow him on Twitter.